Sgt. Cory Wride, 44, was shot and killed while on uniformed patrol while assisting a stranded motorist. After encountering a pickup truck with flashing blinkers at the side of the State Road 73 between Eagle Mountain and Cedar Fort, Sgt. Wride radioed dispatch to advise that he was pulling over to assist. During the stop, Sgt. Wride returned to his patrol vehicle for some paperwork. The passenger in the suspect vehicle opened the back window of the truck and fired on Sgt. Wride with a 9mm handgun, killing him. The suspects fled the scene and were encountered again in Santaquin, where a second deputy was wounded. The suspects fled south on I-15 and carjacked a vehicle in Nephi. At a roadblock set up by Juab County deputies, the suspect was shot and critically wounded. He died the following day. The driver of the car, a 17-year-old girl, was sentenced to prison. Married and the father of five children, Sgt. Wride had served with the Utah County Sheriff’s Office nearly 20 years. My thoughts and prayers go out to his family and co-workers. A hero who should never be forgotten. Just making a regular traffic stop can always turn into something no one expected. You will be sorely missed. May the Lord watch over your family. Such a tragic loss. My heart breaks for this deputy and his family. Cory died serving others. God bless you and your family. God bless you and your family, Chance. I wish I could have known your Dad. It would have been an honor. 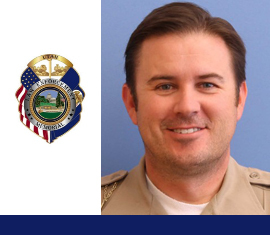 The Utah Peace Officer Association is going to be honoring Sgt. Cory Wride at the Fallen Officer Trail Ride in Moab on April 18 2015. We would like to invite Family and friends to come to the event to help Honor Sgt. Wride and all our Fallen Officers. We will be honoring Sgt. Wride and other victims of Utah gun violence at a Vigil to End Gun Violence on Sunday, December 11, 2016 from 7-8 pm at All Saints Episcopal Church in Salt Lake City. Families are welcome to attend. Being an LEO is a family career. Every time that person goes to work, every single person in the family… their hearts go with that LEO as well. If & when that person doesn’t return from duty, it deeply affects each family membersl, friend, brother, & sister (in arms). Sargent Wride was a hero, as so many LEO’s are. He performed duties that so many are unable & unwilling to do. Prayers to Mrs. Wride, family members, friends, brothers & sisters in arms!